Precision, Quality, Permanence. Telesis has been helping the Aerospace industry meet and exceed the ATA SPEC 2000 direct part marking standard for more than 40 years with robust equipment, innovative engineering, and dependable service and support. Telesis PINSTAMP® dot peen marking systems are designed to permanently mark a wide range of materials, including plastics, steel, and aluminum. We offer the largest range of configurations and accessories available, and all of our markers are built with Precision servo driven stepper motors to quickly and accurately position the marking pin in the correct location within 0.00125”. Our unique and proprietary Pneumatic floating pin technology allows you to mark uneven or curved surfaces precisely with a minimum of moving parts, and our industrial rated guide rails, gearing and motors all combine to provide our customers with a robust, dependable marking system capable of meeting their specific needs. TMP1700/470: A small and compact head, with a 1.5”x2.5” marking window, this unit is ideal for inline integration. The built in Discreet I/O and serial port allow for remote message selection and PLC operational control. 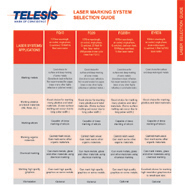 Telesis pulsed LASERs have a long history of success in direct part marking for industry. Accurate, fast, and reliable, our LASERs offer the widest range of solutions for your marking requirements. First to market with the introduction of the Telesis FQ Fiber LASER in 2003, we continue to innovate and expand our offerings with the EV and CO families of galvo steered part marking LASERs. Let Telesis help you select the right product for your SPEC2000 application. Telesis EV-Series family of Vanadate (1064nm and 532nm wavelength) LASERs are designed to proved high quality engraving, ablating, annealing and bonding marking solutions over a wide range of metals and plastics. These LASERs are available in a wide range of powers, from the economical EVC, designed for the low cost, budget minded supplier, to the EV40DPSS high output 1064nm LASERs needed to meet high speed or deep engraving requirements. Telesis FQ series fiber (1064nm) LASERs, supplied to Industry since 2003, are well known and have a proven record of durability and performance. Designed for metal marking and engraving, the small compact design allows for easy integration into customers automated production lines. Available in 10w, 20w and 30w configurations, this LASER is ideal for a wide range of annealing and deep engraving applications. Telesis CO-Series (10.6µm) LASERs, RF-Excited, CO2 sealed tube LASER marking systems are available in 10,30 and 60w outputs with a variety of configuration options, included embedded PC controller for ease of online integration. These units are ideal for LASER bleaching of anodized aluminum, LASER bonding using third part additives on metals, etching of glass and quartz materials, and marking most organic materials. Telesis is more than just marking equipment, we supply a full range of support for your Aerospace application, with our Merlin® Design software, our Custom Engineering Group for Turn Key solutions, and our 24hr Technical Support Center, we are here for you.